I like this ranch it is very good on chicken just watch the sodium intake . I love Hidden Valley Ranch Dressing. I use it in so many recipes. I use it in place of mayo in all sandwiches, for dipping with veggies and breads, in wraps and on chicken pizza. I buy the dry Hidden Valley Ranch dressing and put it in burgers, taco soup, mix it in when making biscuits, sprinkle it on top of crescent rolls gives such a wonderful taste. We love it. My family loves Hidden Valley original ranch dressing. We can not seem to keep enough in our house. My teenagers use it on everything from burritos to sandwiches.nyou name it they are putting ranch on it. My little ones love it to especially for chicken nuggets. The best dressing. 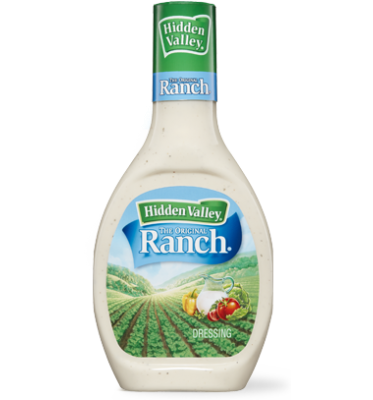 I love Hidden Valley Original Ranch Dressing! It?s great for salads, potatoes, pizza, and French fries! Also delicious on sandwiches or burgers, veggies, chips, pretzels, and chicken strips! It?s my favorite dressing!